I wasn’t planning to comment on Obama’s idiotic “you didn’t build that speech.” I mean, after all, it’s idiotic. So I ignored some of the push back and response from the conservative blogosphere. It was minor anyway compared to MSNBC’s “All Bain, All the Time” news coverage that has been inflicting the network for weeks? Months? But it must have been stuck in my brain somewhere, even if covered by Romney’s tax returns and financial disclosure statements. Sometimes I’m sure that my brain is processing things even when I’m not aware of it. Or at least that’s what I tell myself to justify hours of mindless television; my brain is busy processing something. So sometime this morning, between deep sleep and my second cup of coffee, I realized a few exceptions to Obama’s idea that government makes all things possible. One of them was my grandpa’s road. Decades ago my grandfather built and maintained a road coming off of a county road in order to get to his property. It was all on property he owned and over the years he sold parcels all along the road he had made. Eventually there was quite a cluster of homes coming from this private road, and when my grandfather died, in his will he left the road to the county. So there was a clear case of infrastructure being built by private hands and the government picking it up after all of the hard work had already been done. Of course in the United States that had been the norm. Settlements popped up long before there were local governments to build roads and other infrastructure. By the time government showed up, the town and infrastructure were already there. That still goes on today. New communities and subdivisions built by private interests pay for and build their own infrastructure; which local governments end up inheriting. But there was something else, about the speech, something familiar, and no, it wasn’t that it was basically cribbed from Elizabeth Warren’s rant against’ producers. It took me a bit to place it but then it came to me why I was familiar with the philosophy of that speech. 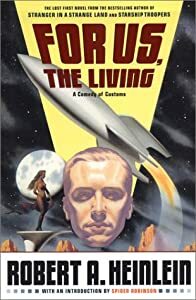 One of the earliest works by Science Fiction author Robert Heinlein was a book called, For Us, The Living. Although it was written in 1938 it was an incomplete work and never finished or published until after Heinlein’s death, when it was found and finished up by another SF writer, Spider Robinson. As a Heinlein fan I was anxious to read it when it was first published in 2003, but this isn’t the libertarian Robert Heinlein I was familiar with from such novels as, The Moon is a Harsh Mistress, or Time Enough for Love. This was the Robert Heinlein in the midst of the Great Depression, who worked on the 1934 California Governor’s race for Socialist Upton Sinclair. So it was a very different Robert Heinlein who wrote this book. A socialist one to be sure, and a writer more influenced by the works of the turn of the century than what passed for science fiction in the 1930’s. In fact, For Us, The Living, is less a novel and more an exposition of what was then a popular socialist idea, Social Credit. Heinlein’s hero is a 1930’s engineer who after having a traffic accident, somehow ends up in the late 21st Century. How he got there is never really explained, and although a gaping hole in the plotline that big is enough to kill interest in a plot, there isn’t really that much plot. The car crash is just a device to get Heinlein’s hero to the future where he can listen to endless lectures on how great the socialist future is. So you can see why Heinlein never had this published in his lifetime. Shame. But I can forgive him for his socialist past; that was quite common in the 30’s, when the only competing philosophies were some version of Socialism and Fascism, or as a distant third way, Keynesian Social Welfare Democracy. There was no William F. Buckley standing athwart history yelling stop in the 1930’s. And in fact it’s not uncommon for people to experiment with communism or some variation of socialism in their youth, particularly in college. Just listen to the rantings of the few remaining Occupy protestors. Blather right out of Mao’s little red book. Probably most of your major big time Democrats were some type of socialist in college, and quite a few Republicans for that matter. But people grow up and in time, put aside childish things. Well not Elizabeth Warren, but she’s an academic who never really left college. And apparently not Barack Obama. I’ve never really joined in the chorus of those calling the President “Socialist” since, when I use the word, I mean it to be descriptive, not a pejorative, but in this situation, the case Obama is making in this speech is Social Credit Socialism. So Obama never outgrew his youthful socialist past. After all, what grown man would want to be friends with an actual for-realsies terrorist like William Ayers? Of course, every time he goes off script he drops hints, going all the way back to his run in with Joe the Plumber. But America has had almost 4 years to get used to the idea, and apparently it’s not a deal breaker. Who would have ever thought that?